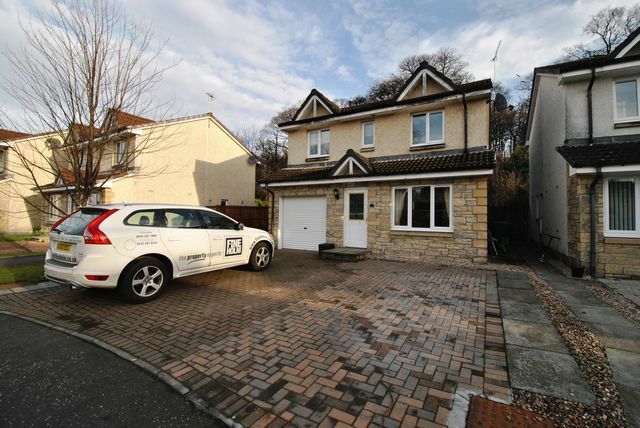 Beautifully presented 4 bedroom detached villa in Cambus. The property comprises a large open plan living room/dining room with French doors off the dining room. This room has front and back windows allowing light to stream through the room. The decor and floorings are neutral. The kitchen has lovely fitted units and all appliances come with the property. There is a separate utility room which also provides direct access to the back garden, which is mainly grass, with 2 patio areas and fully secure and enclosed. A very useable space. Upstairs there are 4 bedrooms. The master has fitted wardrobes and an ensuite. There are a further 2 bedrooms with fitted wardrobes and a 3rd slightly smaller room(currently used a s a study). All rooms have contemporary decor and neutral flooring. The property also has a single garage and private double driveway. Further benefits include GCH and double Glazing. Cambus is located very close to Alloa where all local amenities can be found. Stirling is a 5 minute drive away. Awaiting Landlord Registration: 422121/150/1141 EPC Pending.